Doctors in Nebraska and Spain say tests show two people being treated for Ebola are now free of the virus. American video journalist Ashoka Mukpo will be released soon from the Nebraska Medical Center, where he's been in isolation since returning from Liberia on Oct. 6. In Madrid, nursing assistant Teresa Romero will likely remain hospitalized for another two weeks, but will no longer need to be in isolation. Romero, the first known person to contract the disease outside of West Africa, became infected while treating two priests who were flown back to Spain from Liberia and Sierra Leone. 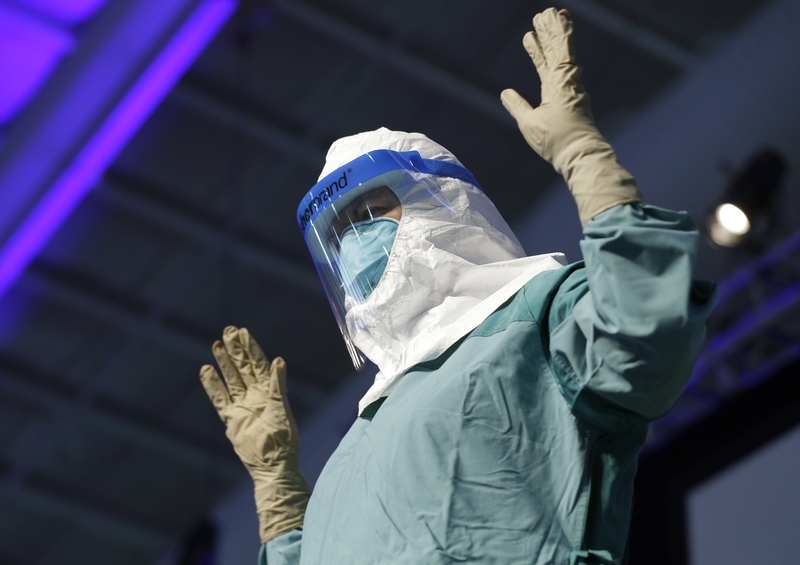 Flash Points: Can visa restrictions keep Ebola out of the U.S.? The Homeland Security Department is now requiring that anyone coming to the United States from one of three West African countries reporting an Ebola outbreak must enter the country through one of five airports screening passengers for the deadly disease. Customs and Border Protection officers earlier this month started screening passengers from West Africa who arrived at New York's Kennedy, Newark Liberty, Washington's Dulles, Chicago's O'Hare and Hartsfield-Jackson Atlanta airports. There are no direct flights from West Africa to the United States and about 94 percent of the estimated 150 daily passengers from the region pass through those five airports. The new requirement means that people traveling from Liberia, Sierra Leone or Guinea who were not originally passing through one of those five airports will have to rebook their flights. The Centers for Disease Control and Prevention is issuing new protective guidelines for medical workers. The advice, released Monday night, had been sought by health workers after two Dallas nurses were infected while caring for a Liberian traveler, the first person diagnosed with the virus in the United States. The CDC said it's still unclear exactly how the nurses were infected, but the stronger rules will provide better protection. CDC officials demonstrated the recommended techniques Tuesday at a training session for several thousand health care workers in New York City. New York Gov. Andrew Cuomo urged the health-care workers there to use their training to educate their families and communities. "Keep the anxiety down. Keep the fear down," he said. The number of people infected with Ebola in western Sierra Leone, on the other side of the country from where the first cases emerged months ago, is soaring with more than 20 deaths daily, the government and local media reported Tuesday. New confirmed cases of Ebola that emerged Monday in two Ebola zones in and around the capital Freetown numbered 49, the National Ebola Response Center reported Tuesday. There are 851 total confirmed cases in the two zones, called Western Area Urban and Western Area Rural, the center said. But there were no new cases in the eastern districts of Kenema and Kailahun, which previously had been an epicenter of the outbreak. There was no immediate official explanation of what has caused the drop in reported new cases there. The research efforts on Ebola vaccines are moving fast. The hunt for an Ebola vaccine will produce data soon about whether two experimental vaccines are safe and could lead to larger medical trials in West Africa by January, a top World Health Organization official said Tuesday. Dr Marie Paule Kieny, an assistant director general for WHO, said clinical trials either planned or underway in Europe, Africa and the U.S. are expected to produce preliminary safety data by December. In the meantime, she said, governments are pushing for immediate "real-world use" of an approved Ebola vaccine. Experts have said the main reason there hasn't been an Ebola vaccine yet is largely due to the relatively small attention the disease received until the recent outbreak. A new challenge is emerging for hospitals already concerned about dealing with potential cases of Ebola. They now have to determine what to do with the staggering amount of contaminated medical waste an Ebola patient generates, reports CBS News Ben Tracy. Each potential patient leaves about eight 55 gallon barrels of hazardous material each day. At a recent congressional hearing, the head of the Centers for Disease Control and Prevention said there are guidelines to deal with this waste. The medical waste can be sterilized or burned but many states do not use medical incinerators because of air pollution concerns. With just two more weeks of campaigning for the midterm elections, the Ebola crisis is a prominent talking point for candidates, reports CBS News correspondent Chip Reid. Republicans are doing their best to tie their opponents to a White House under fire. "Mark Pryor always stands by Barack Obama, whether it's the V.A., the IRS, the Secret Service, our border crisis, or now, Ebola," Arkansas nominee Tom Cotton said of his competition at the state's Senate debate. Some Democrats are firing back, claiming that Republican spending cuts have made the problem worse. "Francis Collins, the head of the NIH said that, but for sequestration, we might have been able to find a vaccination against Ebola," nominee Mark Warner said at the Virginia Senate debate. Why do some people escape Ebola, and not others? It's not clear why Ebola runs a different course in different people. But how rapidly symptoms appear depends partly on how much virus a patient was initially exposed to, said Dr. Joseph McCormick of the University of Texas School of Public Health. Once inside the body, Ebola establishes a foothold by targeting the immune system's first line of defense, essentially disabling its alarms. The virus rapidly reproduces, infecting multiple kinds of cells before the immune system recognizes the threat and starts to fight back. Death usually is due to shock and organ failure brought on by the disease's rapid internal spread. Survival also can depend on how rapidly someone gets care. It also may be affected by factors beyond anyone's control: McCormick's research suggests it partly depends on how the immune system reacts early on - whether too many white blood cells die before they can fight the virus. Other research has linked genetic immune factors to increased survival. The mother of a nurse infected with the Ebola virus says her daughter is doing well and the family is relieved new guidelines for treating patients with the disease are now in place. Debra Berry made the comments during an interview that aired Tuesday on ABC's "Good Morning America." Berry's daughter, Amber Vinson, is being cared for in a specialized unit at Emory University Hospital near Atlanta. Berry said the family is "very confident" Vinson is receiving good care at Emory. Vinson was part of the team that cared for Thomas Eric Duncan at Texas Health Presbyterian Hospital in Dallas. Another nurse there also became infected. Ebola outbreak: Should a travel ban be implemented? European officials are rejecting the idea of stopping direct flights from West Africa as a means of stopping the spread of Ebola. Meeting in Luxembourg, the EU foreign ministers promised to play an "active role" in boosting the world's response to the Ebola outbreak. They are setting out to put together more than $1.25 billion to fight Ebola in the African nations that have been hardest hit. So far, Europe's anti-Ebola pledges stand at about half that amount. As for the idea of a travel ban, France's foreign minister says it would backfire. He says instead of traveling to Brussels or France, passengers from West Africa would fly first to Dubai or somewhere else, and "come in from there." He says, "We would no longer be able to check anything."